Born near Detroit, Michigan, Marshall Crenshaw began playing guitar at age ten and he received his first break playing John Lennon in the off-Broadway company of Beatlemania. In 1987, he played Buddy Holly in the Richie Valens biopic "La Bamba." His self-titled debut album was acclaimed as a pop masterpiece upon its release in 1982 and established him as a first-rate songwriter, singer and guitarist. The record spawned the US Top 40 single "Someday Someway," which rockabilly singer Robert Gordon covered and scored a hit with a year earlier, and other classics such as "(You're My) Favorite Waste of Time," "There She Goes Again" and "Cynical Girl." Along the way, Crenshaw's compositions have been successfully covered by a broad array of performers, including Bette Midler, Kelly Willis, Robert Gordon, Ronnie Spector, Marti Jones and the Gin Blossoms, with whom Crenshaw co-wrote the US Top 10 single "Til I Hear It From You." 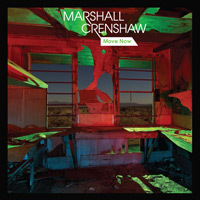 Crenshaw has also provided music for several film soundtracks. In addition to La Bamba, he contributed to Peggy Sue Got Married, and was nominated for a Grammy and a Golden Globe Award for penning the title track for the film comedy Walk Hard: The Dewey Cox Story. A quote from Trouser Press sums up Marshall Crenshaw's early career: "Although he was seen as a latter-day Buddy Holly at the outset, he soon proved too talented and original to be anyone but himself." All Music Guide captured Crenshaw's vibe perfectly: "He writes songs that are melodic, hooky and emotionally true, and he sings and plays them with an honesty and force that still finds room for humor without venom." Over the course of a career that's spanned three decades, 13 albums and hundreds of songs, Marshall Crenshaw's musical output has maintained a consistent fidelity to the qualities of melody, craftsmanship and passion, and his efforts have been rewarded with the devotion of a broad and remarkably loyal fan base. Digite seu endereço de e-mail para Marshall Crenshaw notícias e atualizações relacionadas.